WHEN ACTOR Chris Hemsworth wants to relax on vacation he can think of no better place that the golden beaches of his home country of Australia. Which make him the ideal choice as Australia’s latest tourism ambassador, that and the fact that the Thor star looks pretty good in speedos on a beach. His role as the global ambassador for Tourism Australia’s new campaign was announced today (Friday 15 January). The campaign will focus on the country’s world-class aquatic and coastal experiences. Hemsworth is a beach boy from way back .“From learning how to surf on Phillip Island, fishing with his brothers in the Northern Territory and family beach holidays, Chris has grown up in Australia in and around water and his own personal experiences bring a truly authentic and influential Australian voice to our campaign,” saysTourism Managing Director John O'Sullivan. “Chris truly embodies the Australian way of life and his love of his home country, with all its natural beauty, makes him an ideal ambassador”, he says. So why does Hemsworth rate Australia so highly? 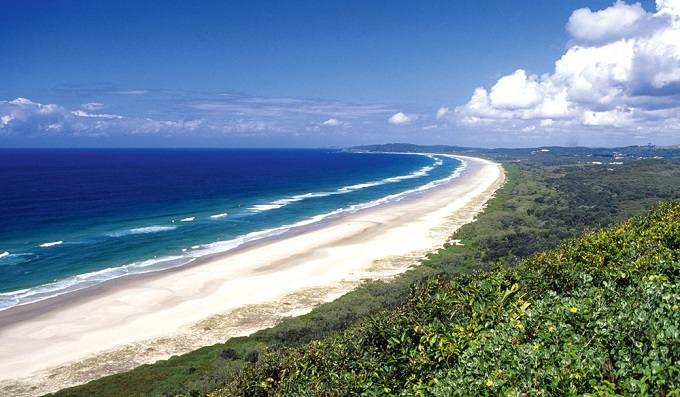 “In Australia you’re surrounded by the most incredible natural beauty. Being in the water or near to it is a way of life for us," Hemsworth says. Two years ago Hemsworth put his money where his mouth is and paid around $7 million for a pavilion-style house near the relaxed beach resort of Byron Bay on the NSW north coast. The opulent eight-bedroom property in Broken Head, is called Kooeloah and should bring a touch of star-power to the laid back region. Then in 2015 He and his family (who had been living in Los Angeles for several years as he carved out an impressive Hollywood career) relocated to Australia permanently. Hemsworth, his two year-old daughter India and year-old twin sons, Sasha and Tristan, and Spanish wife Elsa Pataky are now back in his native Australia. “We can walk straight down (to) the beach, we can have a normal existence and the kids have a hell of a lot more fun there than they did back in the States,' he recently told a radio show. 'It wasn’t a hard decision to move back to Australia because this part of the world is such a special place. This is the place I want my kids to grow up -- that’s the world I want them to be part of, he says. “I’m really looking forward to launching this new campaign and sharing with the rest of the world just how amazing this country really is'. Hemsworth launches the campaign in New York.